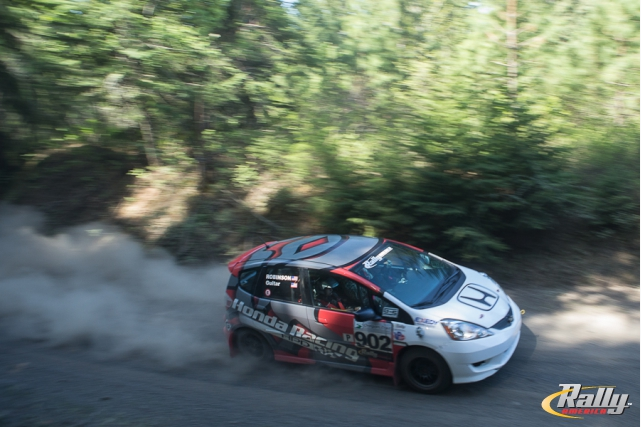 Team Honda Research partnered with Honda Performance Development to showcase the B-Spec Fit developed specifically for Rally competition at the third round of the Rally-America National Championship. Now into the third of seven National Championship rounds, the B-Spec Fit enjoyed two strong first-place finishes in the new B-Spec class at the Sno*Drift and 100 Acre Wood Rally. “We are happy to have two good rounds in the year so far, and we’re also looking forward to an event with no snow and ice!” James stated, prior to the start of Friday nights’ (May 3) spectator stages. After the evening stages were finished, the B-Spec Fit was first in class, with roughly a one-and-a-half minute margin over the second-place Toyota Yaris. Moving into the second day of competition, the teams left Portland and moved into the Mt. Hood region, home to some very technical and rough wooded stages. Stages 5-10 all were rough, technical, and had fantastic vistas… had the team had any time to look! “This is our first time to compete here in Oregon, and the views from the stages are unbelievable!” James said, upon arriving at the first service. 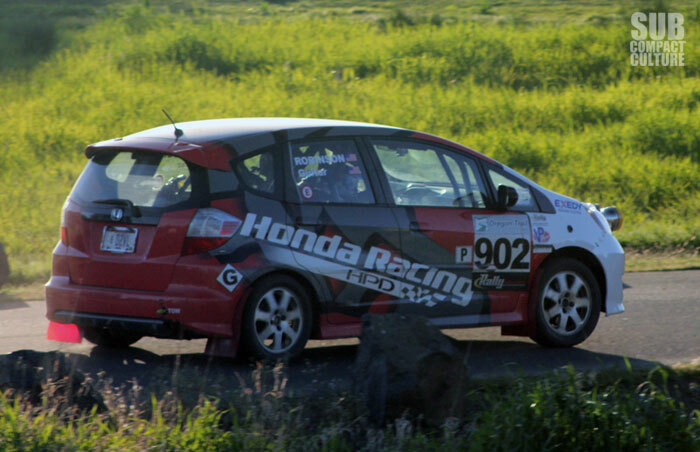 Things took a bit of a turn on Stage 11, when a freshly exposed rock severely damaged the Fit’s lower engine mount and cracked the oil pan. “We were able to limp the car out of Stage 11, through Stage 12 and back to main time control while only incurring a two-minute penalty,” a relieved Jordan noted at the day’s completion. “This will allow us to patch up the car as best we can and keep going tomorrow for the fast stages outside of Dufur.” Even with the time penalty and having to slow the car during the last two stages, the Fit was able to maintain first position among the B-Spec cars. After a long night of repairs, the team awoke for the third and final day of competition, in the rolling hills outside of Dufur. At the first service after Stages 13 and 14, The B-Spec Fit returned to unsettling news. “The stages are fast, but incredibly rough!” James exclaimed. “We’re going to have to go into safety mode to make sure we can get through the remaining three stages!” After a hasty service where the repairs from the previous night were confirmed to be holding, the team headed out for a repeat of the first two rough stages. Although the team was disappointed to have a DNF this season, the THR B-Spec Fit still comfortably holds onto first place in the B-Spec National Championship, and has also picked up some valuable experience for improving the Fits’ durability in very rough, rocky events. “This actually gives us a very good piece of information moving into the later rounds, especially Maine Forest Rally, which is notoriously rough,” James said after returning to service. Look for the THR B-Spec Fit at the next round of the Rally America National Championship Series, on May 30th -June 1st in Wellsboro, Pennsylvania. The third race on the Rally America National Championship schedule, Oregon Trail is the only three-day rally event in the Championship that takes place in urban Portland, OR and through the Mt. Hood farmlands outside the city. With fast stretches, combined with twisting foothill runs, this rally is always packed with excitement. This rally offers fans the best rally viewing opportunities, due to its accessibility and wide-open unobstructed areas.